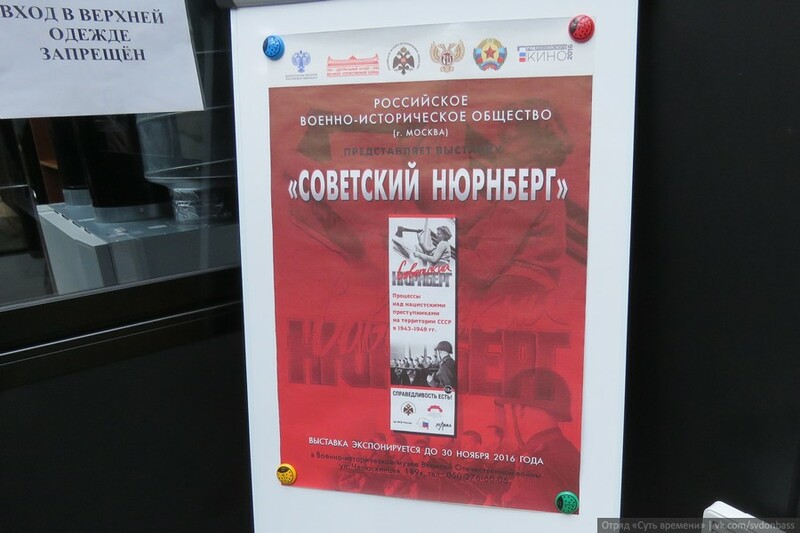 "The vow of Krasnodon residents"
On November 1 we have visited Donetsk Museum of the Great Patriotic War, where the “Soviet Nuremberg” exposition is taking place. 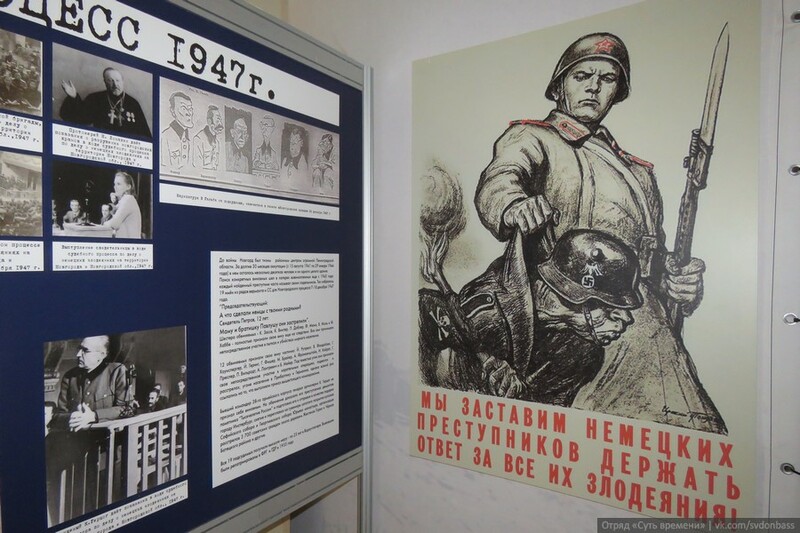 The materials for the exposition were presented by the Central Museum of the Great Patriotic War of Moscow and are dedicated to the trials over the Nazi criminals and their accomplices, which took place in USSR from 1943 to 1949. The Soviet Union had already started to try war criminals even before the international tribunals in Nuremberg and Tokyo. 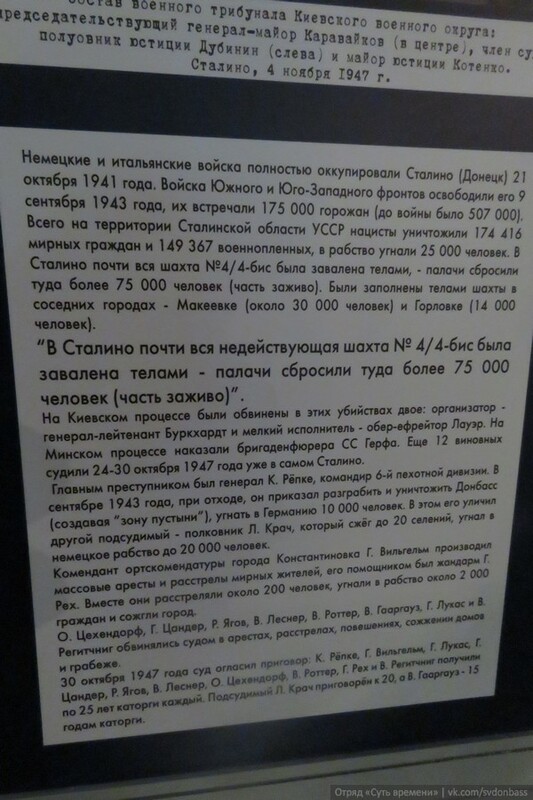 On April 19, 1943, the Presidium of USSR Supreme Soviet (Council) issued decree № 39 “On the measures of penalty for German fascist criminals guilty of murders and tortures of Soviet civil population and Red Army POWs, for spies, traitors of Motherland from the ranks of Soviet citizens and for their accomplices.” Thousands of murderers were tried, the most violent and large-scale crimes were open for the public. 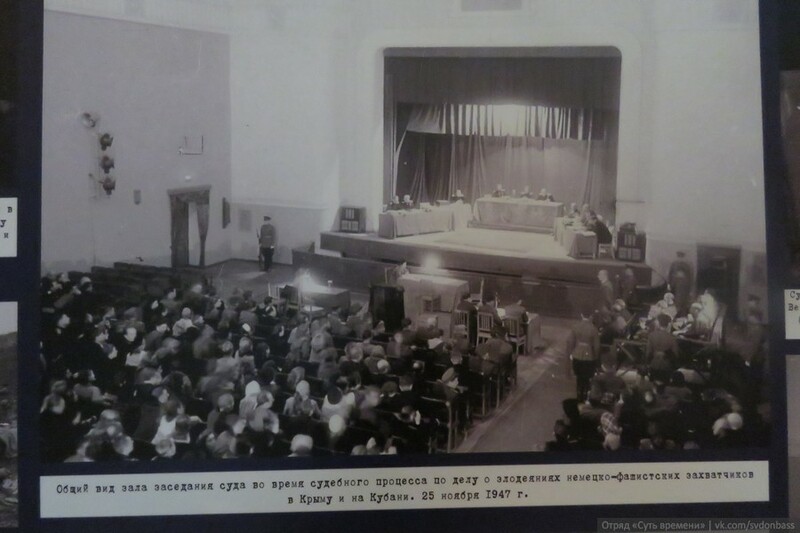 The trials were filmed, Soviet and foreign mass media reported from the courtrooms. 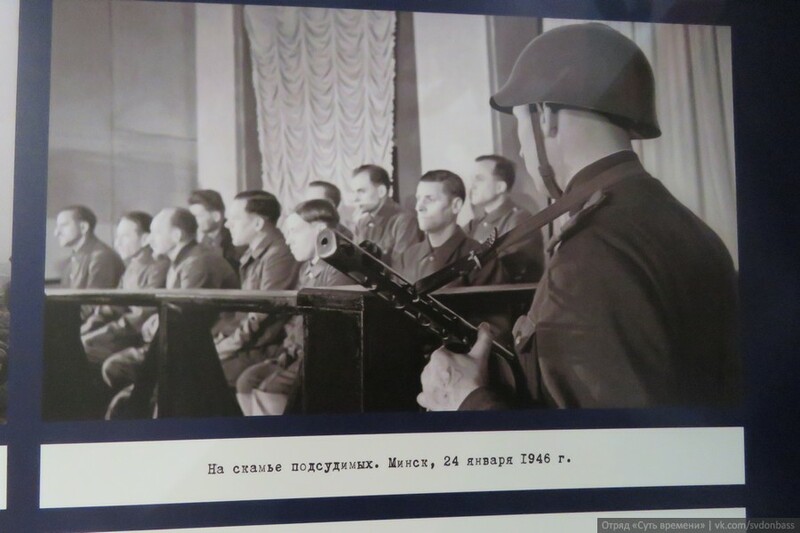 Public trials on crimes of extreme violence and inhumanity took place in 21 city: Donetsk, Kiev, Riga, Velikie Luki, Nikolaev, Leningrad, Minsk, Bryansk, Smolensk, Kharkov and others. 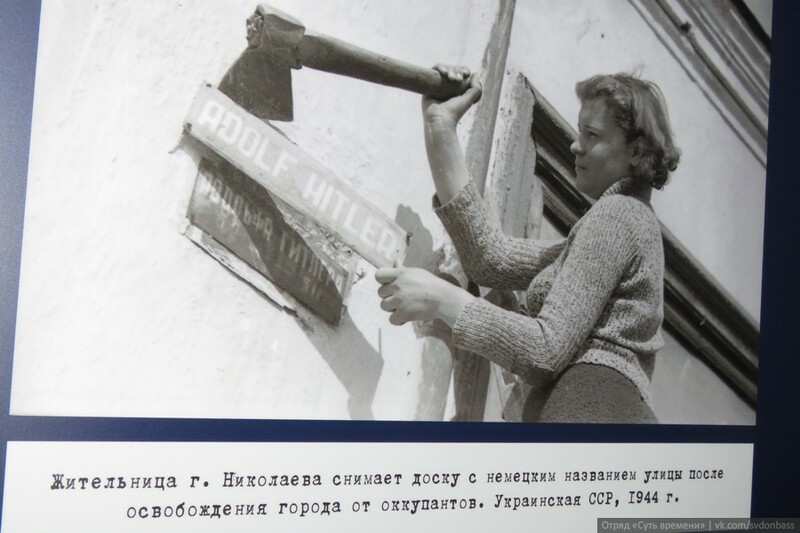 Resident of Nikolaev city takes of the street sign after the city was liberated by the Red Army. Ukrainian Soviet Socialist Republic, 1944. Soldiers of Ukrainian auxiliary police (with white bands) under supervision of Germans prepare to execute Jews in Chernigov. 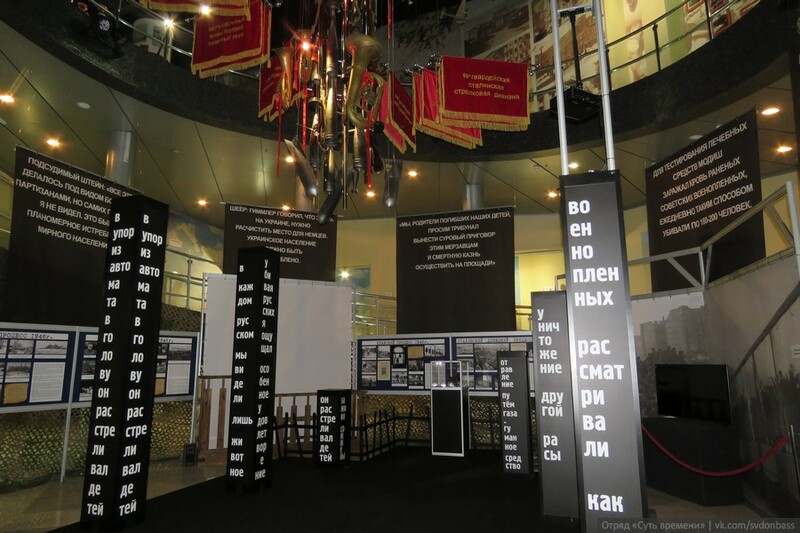 The authors of the exposition treated their job most seriously — real transcripts of the trials, documents, testimonies of witnesses and the defendants, verdicts of the tribunal are shown. 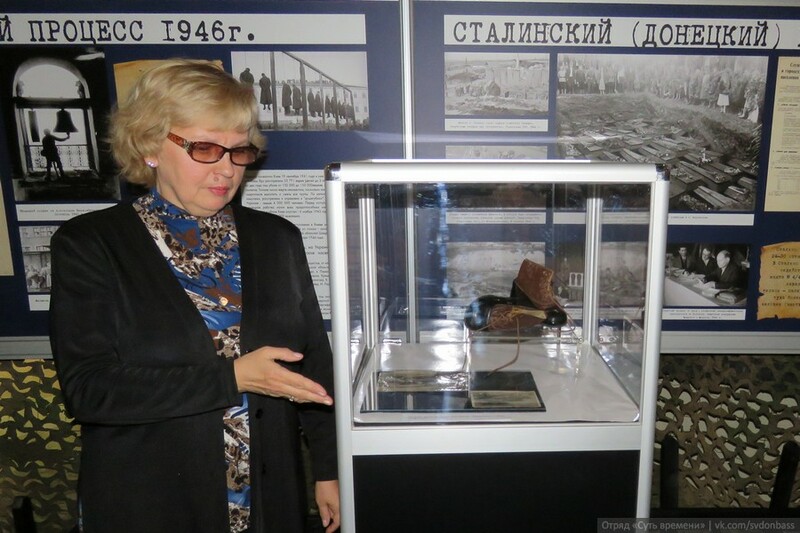 The director of the museum, Liudmila Dekurno, gave us a tour, told about specific facts of crimes during Nazi occupation of Stalino (as Donetsk was formerly known). 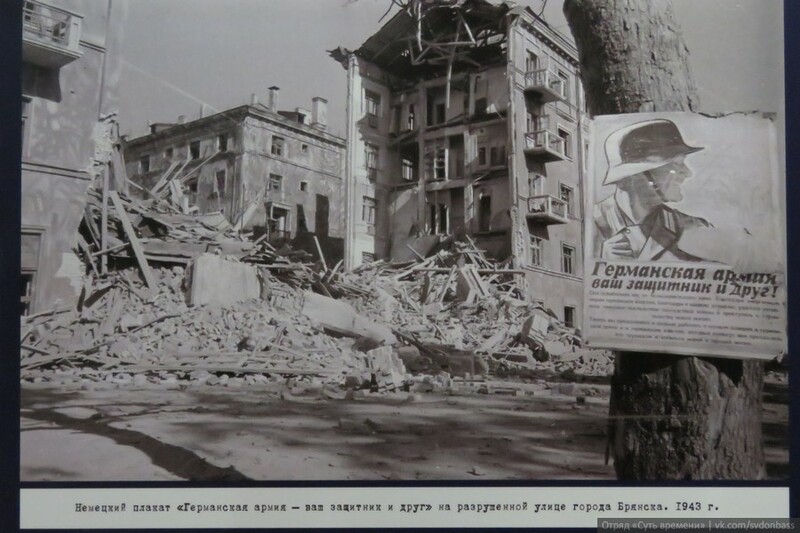 Caption on the poster (left): “German and Italian troops fully occupied Stalino (Donetsk) on Octoer 21, 1941. 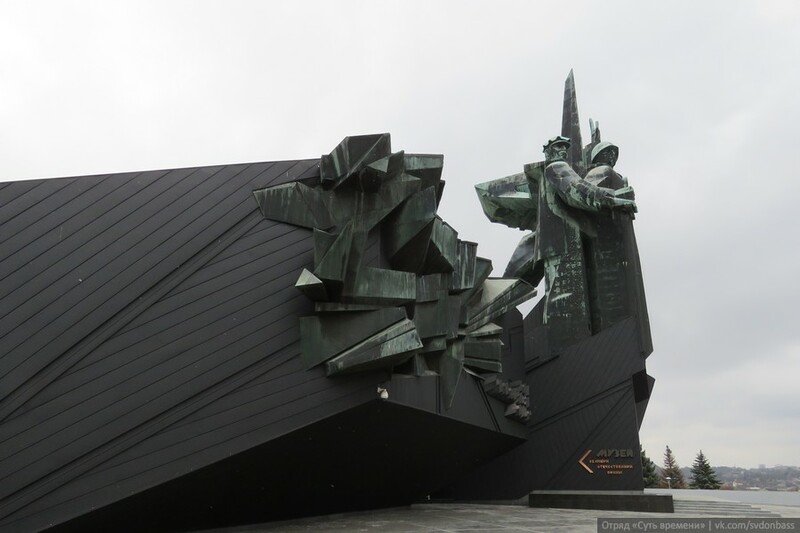 The troops of the Southern and South-Western fronts liberated it on September 9, 1943, and were met by 175 thousand citizens (there were 507 thousand before the war). 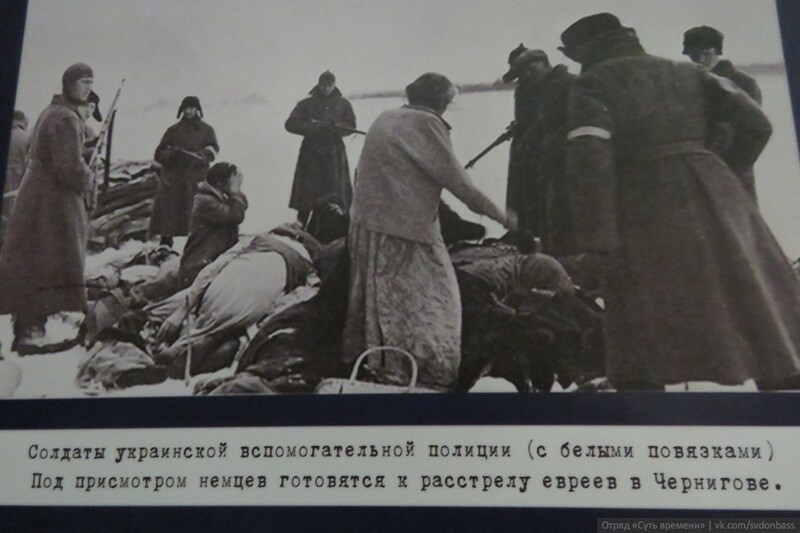 On the territory of Stalino region of Ukrainian Soviet Socialist Republic Nazis exterminated a total of 174416 civilians and 149367 prisoners of war, another 25000 people were enslaved and taken to Germany. Almost all of №4/4-B mine was full of human bodies – the executioners threw there over 75000 people (part of them were thrown down alive). 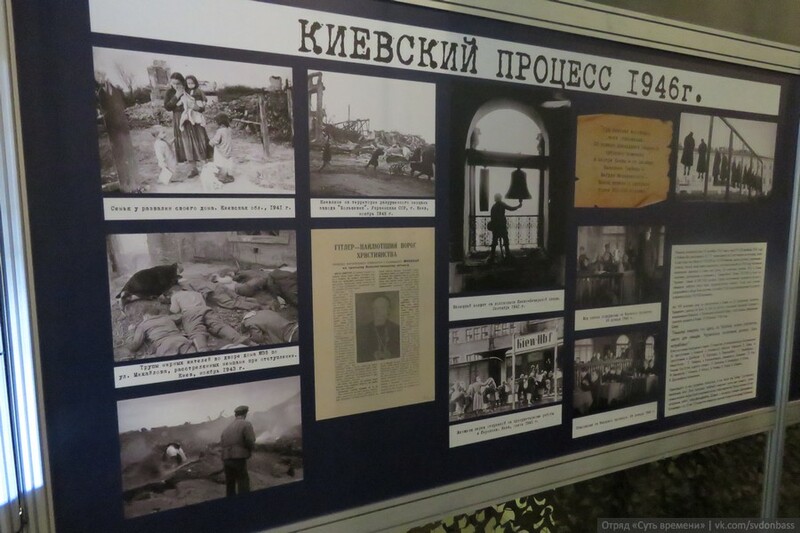 Mines in nearby towns were also full of bodies – approximately 30000 people in Makeevka and 14000 in Gorlovka. 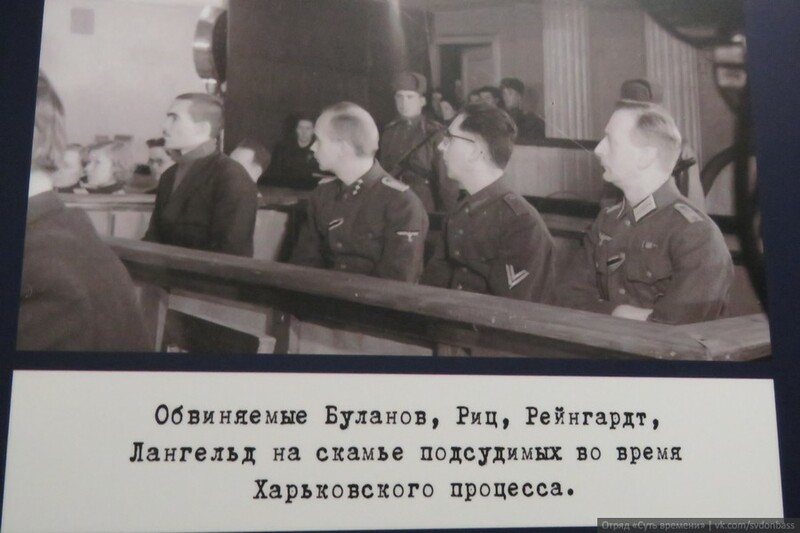 Two people were accused of these murders on the Kiev trials: the organizer – lieutenant-general Burkhardt and a petty executioner – obergefreiter Lauer. SS-Brigadeführer Gerf was sentenced during the Minsk trials. Another 12 criminals were tried on October 24-30, 1947, in Stalino itself. The primary criminal was general Kurt Röpke, the commander of the 6th infantry division. 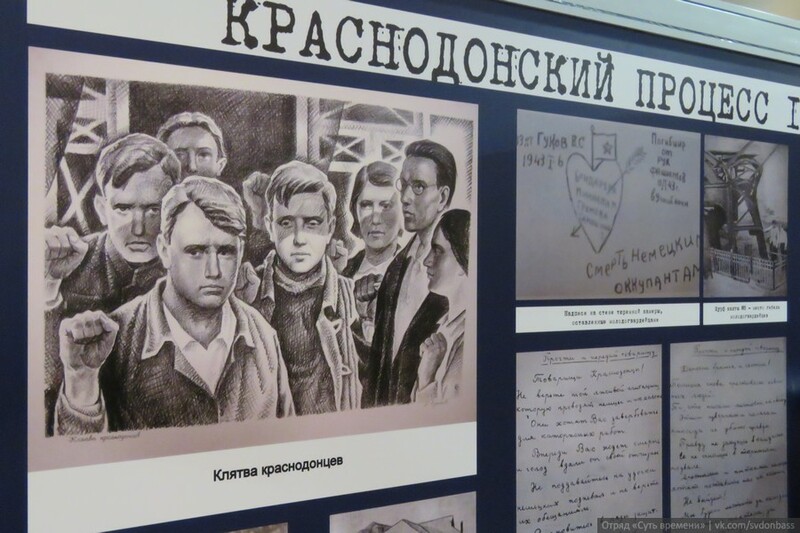 In September 1943, during the retreat, he ordered to plunder and destroy Donbass (creating a “desert zone”), to enslave and drive to Germany 10000 people. Another of the defendants pointed out to his crimes — it was colonel Leonhard Kratsch, who burned up to 20 villages and drove to German slavery up to 20000 people. The commandant of the Konstantinovka town Wilhelm conducted mass arrests and executions of local residents, he was assisted by Rech. Together they executed approximately 200 people, drove to slavery approximately 2000 citizens and burned the town. A number of other Nazi criminals were accused of arresting, shooting, hanging people, burning houses and plunder. 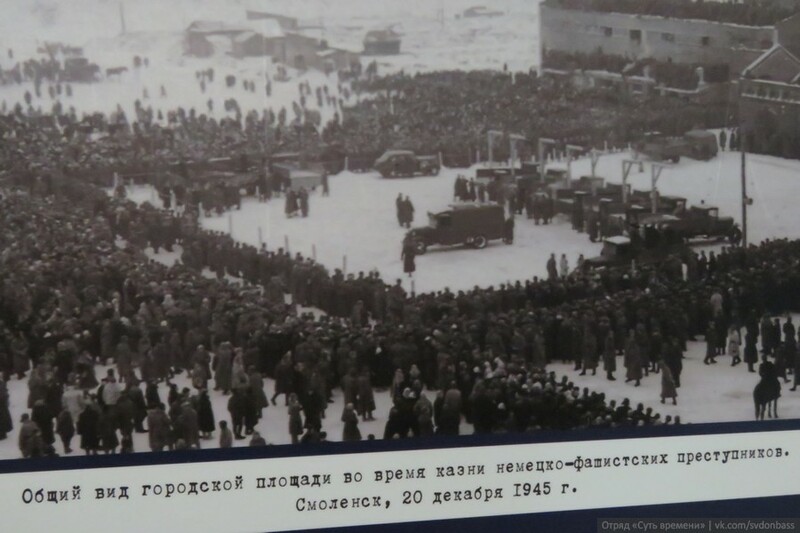 According to the administration, the number of people daily visiting the museum increased significantly. The topic of the tribunal over Nazi criminals is current as never before. 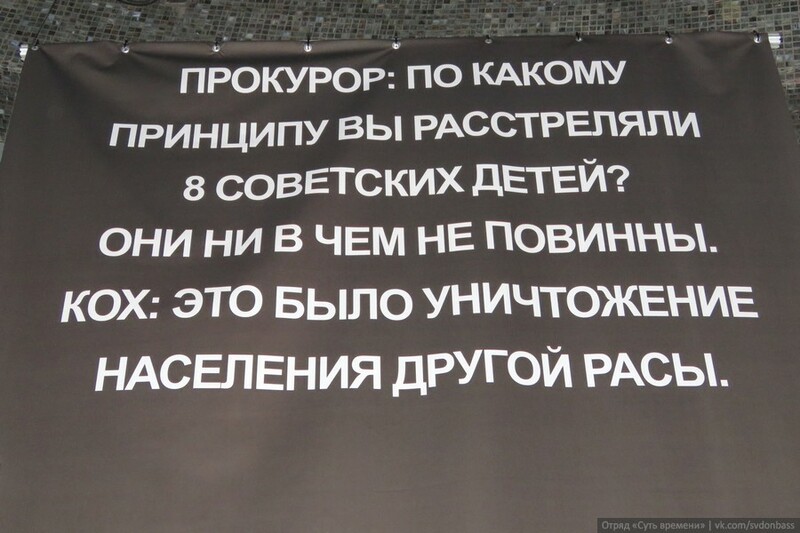 Sooner or later, the trial over the Bandera Nazi punitive forces, those guilty of the Odessa tragedy, murderers of the elderly, of women, and of children of Donbass, will necessarily take place. For this reason, with the help of such expositions, we study the experience of our grandfathers. Not for a second must we forget that thousands of sons of our Motherland, defenders of Donbass, warriors who stood up to fascism, gave their lives for the sake of this just retribution. We remember each and every one of them by name. 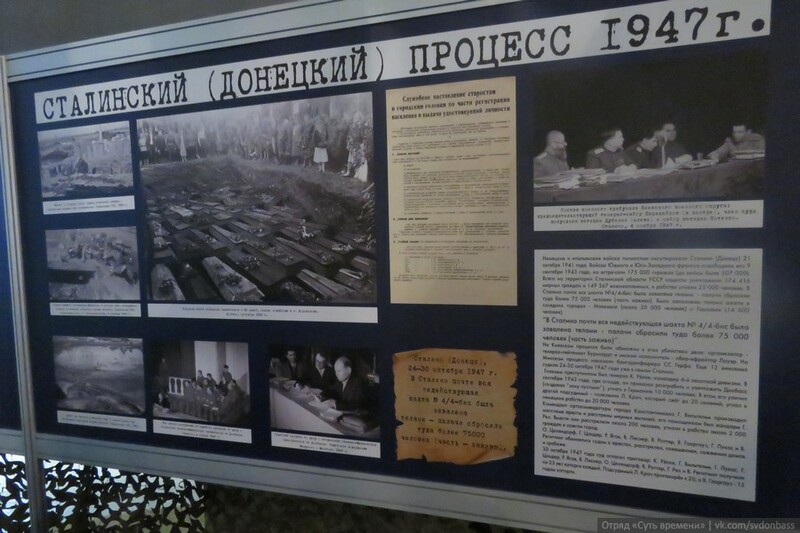 This entry was posted in News from Ukraine and tagged Donetsk, DPR, Nazism, USSR, War crimes. Bookmark the permalink.